On show nights, we open the box office for ticket collections two hours before the advertised door time, which can be found by looking on the performance information page or getting in touch with us. 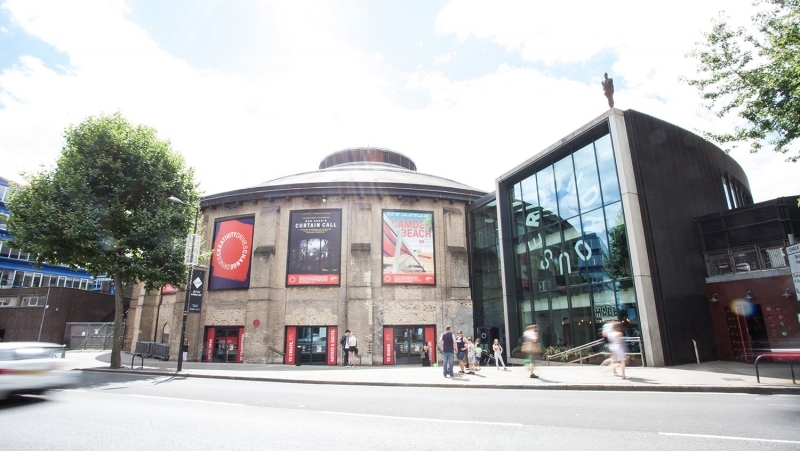 If you want to come and collect your tickets early, you can do so during our standard opening hours, unless you have been instructed otherwise from doing so by email. There are a few steps leading down to the venue, by the main doors. For wheelchair access, aim to the left of the studios entrance where there is a dropped curb, marked ‘Wheelchair Access’. From here, you can access the ramp to all other entrances. If you need to collect tickets, enter via the box office. If you already have your tickets on you, feel free to use the main entrance. When you arrive, there might be fencing and a queue down the road of people waiting to get in. There will be security stewards directing this queue. If you require early access, make yourself known to one of these stewards who will be able to contact the box office manager, duty manager or assistant manager on your behalf. They will in turn be able to direct you of the best course of action. Alternatively, come straight to the box office from where we will also be able to help you. To pick up your tickets, you will need a form of identification – a payment card will be fine unless the performance information specifically states that you’ll need to produce photographic ID. You will also be asked to verify your postcode too. We only ask this to ensure we’re giving the tickets to the right people. You will not be asked for any ‘proof of disability’ to pick up your access tickets, though you or others in your party may be asked to provide proof of age to pick up any concessionary rate tickets or if there is an age restriction on the event. If you have requested any other access facilities such as the use of one of our wheelchairs or Hearing Enhancement Systems (main space and Sackler space only), this will be available for collection from box office also. There is a dropped counter on both sides of the counter. Once you’re inside, there will be a number of security staff as well as venue assistants and visitor services assistants. If you need any assistance or you have any concerns or questions, please don’t hesitate to ask any of them for assistance. We also have an accessible baby changing facility next to the studio theatre on Level 0 and in the main space Level 1. All fittings comply with Part M of the Building Regulations. We do not currently offer a Changing Places toilet facility, but are hoping to include this in our next refurbishment. We welcome audience members who need to bring medicines, medical equipment, food or drink to manage a medical condition. If you have any concerns about being allowed entry with any items you require, please don’t hesitate to get in touch. For music performances and large scale events, we have trained medics on site and all of our duty and management staff are First Aid trained. Guide dogs and assistance dogs are all welcome in our building. If you would like your dog to be looked after whilst you are watching an event, this can be pre-arranged by getting in touch in advance. We will arrange for someone to meet you at Box Office, guide you to your seat and stay with your dog throughout the event.